The Funds file their complete schedules of portfolio holdings with the Securities and Exchange Commission (the “Commission”) for the first and third quarters of each fiscal year on Form N-Q within 60 days after the end of the period. The Funds’ Form N-Q filings are available on the Commission’s website at http://www.sec.gov, and may be reviewed and copied at the Commission’s Public Reference Room in Washington, DC. Information on the operation of the Public Reference Room may be obtained by calling 1-800-SEC-0330. The most current Form N-Q filing is also available on the Funds’ website at www.citynationalrochdalefunds.com and without charge, upon request, by calling 1-888-889-0799. A description of the policies and procedures that the Funds use to determine how to vote proxies relating to the Funds’ portfolio securities, and information on how the Funds voted proxies relating to portfolio securities during the most recent 12-month period ending June 30 is available (1) without charge, upon request, by calling 1-888-889-0799, (2) on the Funds’ website at www.citynationalrochdalefunds.com, and (3) on the Commission’s website at www.sec.gov. This annual report covers the one-year period ended September 30, 2016. Heading towards the end of the calendar year, risk assets have delivered a wide range of performance outcomes, though mostly positive. The U.S. economy remains on a modest, but solid growth path and appears largely insulated from the direct effects of the slowdown in global growth. The impact of the United Kingdom’s vote to leave the European Union (the “E.U.”) (“Brexit”) is likely to have relatively a small direct impact on the U.S. economy. U.S. economic indicators have improved recently, confirming our view that underlying domestic demand remains solid. We believe there is little evidence to support fears of a major global downturn. China continues to face challenges, but we believe its economy is not collapsing and data from other major economies, while slow, have generally been positive. Geopolitical events, Federal Reserve (“Fed”) tightening, the U.S. presidential election, and uncertainty over global growth may result in heightened volatility and depressed yield levels, but we expect solid returns for U.S. stock investors over the next 12 months. Within fixed income markets, credit quality positioning was of key importance throughout the year, particularly during the most recent quarter. Energy companies were under significant pressure, as $40 - $50 oil (per barrel) dramatically changed profitability projections across the sector. However, these companies seemed to learn to live within this span and defaults in the high yield and low yield space did not spike dramatically (however, the environment is still very challenging, depending on company level leverage). After quickly shaking off a brief bout of volatility spurred by the U.K.’s vote to exit the E.U. at the end of June, corporate credit spreads resumed their tightening trend over the third quarter (“Q3”). As volatility subsided, the flight to safety abated, leading to a slight upward shift in interest rates for U.S. Treasury bonds. Global central banks have maintained their exceptionally easy monetary policies; however, the Bank of Japan has changed its focus to managing the shape of the yield curve from managing short-term interest rates and quantitative easing. Shaking off Brexit-induced volatility, corporate credit spreads tightened in Q3. The fixed-income markets performed exceptionally well in the first half of 2016 as the combination of declining interest rates and tightening credit spreads lifted bond prices and generated returns well in excess of the amount of yield carry that bonds would have otherwise generated. Fed officials have shifted from a defensive stance in the wake of the Brexit vote, to one of cautious optimism. However, the Fed will likely want to see more data before it is willing to commit to another rate hike. Expectations are growing, however, with the Fed funds futures market now pricing in about a 50-75% chance of a rate hike in December. 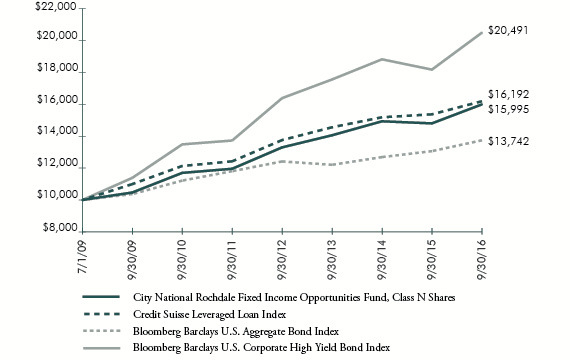 City National Rochdale’s proprietary Multi-Factor Bond Market Model continues to find opportunistic fixed income relatively attractive. The collapse in energy prices is creating significant stress among energy borrowers, but other industries remain relatively healthy. As long as default rates remain low (a reasonable assumption given our gross domestic product (GDP) forecast), below investment-grade debt looks attractive. U.S. stocks continued their march higher in the third quarter. Stocks continued to climb over the summer as worries over higher rates, emerging markets, and commodities mostly faded. Investors were still trying to make sense of the Brexit vote as the quarter began, but that quickly fell into the background as the market was generally docile for most of the summer. The quiet was driven by a few factors. First, U.S. economic data was strong enough to not cause worry about a recession, but not so strong that the Fed would be forced to raise rates. Secondly, fears around China and other emerging markets that had been center stage earlier in the year eased. And finally, even though oil prices did bounce around, they remained much higher than the levels seen at the start of the year. Volatility picked up again toward the end of the quarter as the market reassessed the prospect of a rate increase and concerns over the health of Deutsche Bank kept surfacing. As the fourth quarter (“Q4”) gets started those concerns will likely remain in focus. Corporate earnings growth is expected to improve modestly through 2017 as global headwinds of lower energy prices and the stronger dollar slowly fade. Market valuations are in line with long term averages and do not appear excessive, though further multiple expansion is unlikely given larger downside risks. Coming into 2016, we expected to face choppy seas amidst a backdrop of shifting global economic currents and uncertain monetary policy developments around the world. Our unwavering focus on risk management and downside protection continues to serve us well, as capital preservation will always be of paramount importance within all of the investment strategies that we manage. As always, we thank you for your trust and confidence in our abilities to continue to serve you well through your investment in the City National Rochdale Funds. Past performance is no guarantee of future results. Certain shareholders may be subject to the Alternative Minimum Tax (AMT). Federal income tax rules apply to any capital gain distributions. This information must be preceded or accompanied by a current prospectus. Please read the prospectus carefully before investing. 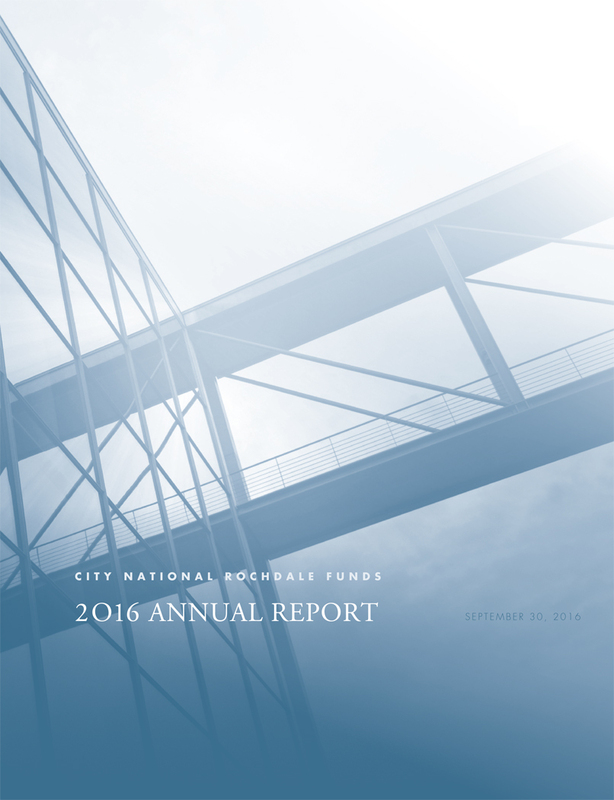 City National Rochdale Funds do not generally accept investments by non-U.S. persons and may not be available in all states. Bloomberg Barclays U.S. 1-5 Year Government Bond Index is an index of all investment grade bonds with maturities of more than one year and less than 5 years. The index is a market value weighted performance benchmark. Bloomberg Barclays 1-5 Year U.S. Corporate A3 or Higher, 2% Issuer Constrained Index includes U.S. dollar-denominated, investment-grade, fixed-rate, taxable securities issued by industrial, utility, and financial companies, with maturities between 1 and 5 years. 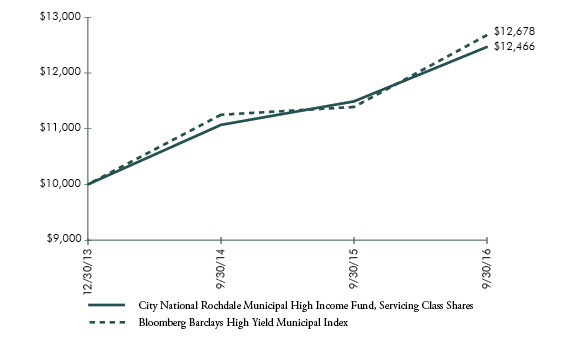 Bloomberg Barclays High Yield Municipal Index is an unmanaged index made up of bonds that are non-investment grade, unrated, or rated below Ba1 by Moody’s Investors Service with a remaining maturity of at least one year. Citigroup High Yield Market Capped Index is a US Dollar-denominated index which measures the performance of high-yield debt issued by corporations domiciled in the US or Canada. Recognized as a broad measure of the North American high-yield market amongst all Citi’s fixed income indices, it includes cash-pay and deferred-interest securities. All the bonds are publically placed, have a fixed coupon, and are non-convertible. Bonds issued under Rule 144A are included in their unregistered form. Bloomberg Barclays Intermediate U.S. Government/Credit Index consists of publicly issued, dollar-denominated U.S. Government, agency, or investment grade corporate fixed income securities with maturities from 1 to 10 years. The comparative market index is not directly investable and is not adjusted to reflect expenses that the SEC requires to be reflected in the fund’s performance. Credit Suisse Leveraged Loan Index is designed to mirror the investible universe of the $U.S.-denominated leverage loan market. 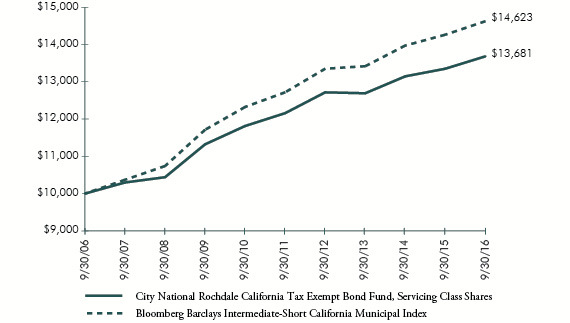 Bloomberg Barclays Intermediate-Short California Municipal Bond Index measures the performance of California municipal bonds. The Servicing Class Shares of the Fund posted a return of -0.20% for Q3, which slightly underperformed the Bloomberg Barclays U.S. 1-5 Year Government Bond Index’s -0.17% return. Calendar year to date, as of September 30, 2016, the Fund is lagging the benchmark’s return of 2.18% by 62 basis points with a return of 1.56%. For the fiscal year ended September 30, 2016, the Servicing Class Shares of the Fund have returned 0.84% and the benchmark has delivered a return of 1.52%. As of the most recent quarter, the portfolio maintained its short duration positioning relative to the benchmark in anticipation of an eventual rise in interest rates. This proved to be a headwind during the quarter, as longer duration assets outperformed shorter duration positions. Morningstar rankings reflect the low risk approach of the Fund’s management, as the Fund tracks the benchmark very closely. Due to its capital preservation style, consistency since inception, and the high credit quality of its holdings, we believe the Fund is an attractive investment in a conservative space. The Servicing Class Shares of the Fund posted a return of 0.68% for Q3, outperforming the Bloomberg Barclays 1-5 Year A3 or Higher U.S. Corporate Index’s return of 0.23%. Calendar year to date, as of September 30, 2016, the Fund is outperforming its benchmark by 0.06% (3.14% for the Fund versus 3.08% for its benchmark). For the fiscal year ended September 30, 2016, the Servicing Class Shares of the Fund have underperformed its benchmark’s return by 0.16 (2.69% for the Fund versus 2.85% for its benchmark). As of the most recent quarter, the Fund continued to outpace its benchmark from a yield and total return perspective, driven by an emphasis on investing in lower quality bonds within the investment grade universe. Sector allocation was additive to relative performance as bonds within the Industrial sector outperformed bonds within the Financial sector. 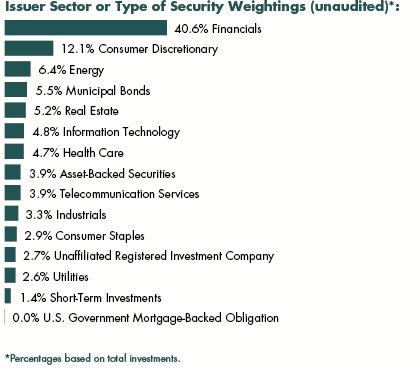 Issuer selection within the Financial sector accompanied by slightly underweight duration relative to the benchmark was a performance tailwind. The Servicing Class Shares of the Fund posted a return of -0.13% for Q3, outperforming the Bloomberg Barclays Intermediate-Short California Municipal Bond Index’s return of -0.19% by 6 basis points. Calendar year to date, as of September 30, 2016, the Fund matched the benchmark’s return of 1.98%. For the fiscal year ended September 30, 2016, the Servicing Class Shares of the Fund returned 2.48%, lagging the benchmark’s return of 2.53% by 5 basis points. Yield curve positioning during the third quarter was the driver of outperformance. As short-term yields moved higher we added daily and weekly notes to the Fund portfolio. In addition, the Fund maintained its barbell structure enhancing the returns year to date and over the fiscal year. With short-term rates rising and long term rates shifting downward, the flattening of the yield curve provided a boost to the Fund’s performance. The Fund’s underweight to California General Obligation bonds was additive to performance during the last quarter as the Fund’s yield spreads widened. Another underweight compared to the benchmark was pre-refunded bonds, which helped performance throughout the year. The Fund maintained a neutral duration throughout the first three quarters of the fiscal year but was slightly short compared to the benchmark throughout most of the last quarter, which added to the outperformance. The Servicing Class Shares of the Fund posted a return of 0.22% for Q3, underperforming the Bloomberg Barclays High Yield Muni Index’s return of 1.29% by 107 basis points. Calendar year to date, as of September 30, 2016, the Fund lagged the benchmark’s return of 9.37% by 311 basis points with a return of 6.26%. For the fiscal year ended September 30, 2016, the Servicing Class Shares of the Fund returned 8.50%, lagging its benchmark’s return of 11.32% by 282 basis points. versus the benchmark holding of approximately 24%, and the Fund held less than 2% during Q3. Despite worsening financial distress and a default on July 1 of Puerto Rico’s general obligation bonds, prices generally rose during the year, contributing to the Fund’s underperformance. The team does not believe that a significant holding in Puerto Rico bonds is appropriate, given the continued decline in credit quality on the island. MSA-backed bonds are a significant part of the index as well; the Fund holdings were less than 10% throughout the year and quarter, as part of the Fund’s fundamental policy of remaining diversified across different sectors and individual holdings. The Servicing Class Shares of the Fund posted a return of 5.29% for Q3, lagging the Citigroup High Yield Market Capped Index’s return of 5.39% by 10 basis points. Calendar year to date, as of September 30, 2016, the Fund is behind the benchmark’s return of 15.36% by 223 basis points with a return of 13.13%. For the fiscal year ended September 30, 2016, the Servicing Class Shares of the Fund returned 9.61%, underperforming its benchmark’s return of 12.46% by 285 basis points. The Fund underperformed its benchmark in nearly all situations because of asset class exposure and risk weights. As of September 30, 2016, the Fund has 83% exposure to high yield bonds and 17% exposure to higher quality assets, such as bank loans (7%), investment grade bonds (5%), and cash (3%). The manager has upgraded the average credit quality of the overall portfolio over the course of the last year, which was intended to help insulate against elevated volatility that has punctuated credit markets over the past few years. The Fund’s approximate 7% allocation to bank loans has also been a constructive hedge against downside risk, as senior secured paper has performed relatively well during periods of market stress. When comparing attribution of returns for only the high yield bonds, the underlying performance has been in line with its benchmark. Therefore, we understand the underperformance and while it is not ideal to lag the benchmark, we are pleased with the absolute level of returns the Fund has produced. The Class N Shares of the Fund posted a return of 0.51% for Q3, outperforming the Bloomberg Barclays Intermediate U.S. Government/ Credit Index’s return of 0.16%. Calendar year to date, as of September 30, 2016, the Fund is underperforming its benchmark’s return of 4.24% by 17 basis points with a return of 4.07%. For the fiscal year ended September 30, 2016, the Class N Shares of the Fund returned 3.72%, outperforming its benchmark’s return of 3.52% by 20 basis points. As of the most recent quarter, the Fund continued to outpace its benchmark from a yield and total return perspective, driven by an emphasis on investing in lower quality bonds within the investment grade universe. The significant overweight to corporate credit has been the most meaningful driver of underperformance over the last year. Corporate sector allocation was additive to relative performance as bonds within the Industrial sector outperformed bonds within the Financial sector. Issuer selection within the Financial sector accompanied by slightly underweight duration relative to the benchmark was a performance tailwind. The Fund posted a return of 3.95% for Q3, outperforming the Credit Suisse Leveraged Loan Index’s return of 3.10% by 85 basis points. Calendar year to date, as of September 30, 2016, the Fund is outperforming its benchmark’s return of 7.44% by 88 basis points with a return of 8.32%. For the fiscal year ended September 30, 2016, the Fund has returned 8.04%, outperforming its benchmark’s return of 5.33% by 271 basis points. The Fund’s diversified asset class exposures have been instrumental in delivering an attractive yield profile, without assuming an inordinate amount of interest rate risk. With just over 30% of the Fund allocated to a combination of domestic and European bank loans, the strategy has been well positioned to withstand the elevated volatility experienced in credit markets. The Fund’s emerging markets high yield and U.S. high yield bond allocations have been two of the strongest performers during the year. Both of these areas outperformed the more conservative segment of bank loans. This material represents the managers’ assessment of the portfolios and market environment at a specific point in time and should not be relied upon by the reader as research or investment advice. Performance data quoted represents past performance and does not guarantee similar future results. The investment performance and principal value of an investment will fluctuate so that an investor’s shares, when redeemed, may be worth more or less than their original cost, and current performance may be lower or higher than the performance quoted. For performance data current to the most recent month end, please call 1-888-889-0799. The Government Bond Fund’s, Corporate Bond Fund’s, California Tax Exempt Bond Fund’s, Municipal High Income Fund’s, High Yield Bond Fund’s, Intermediate Fixed Income Fund’s and Fixed Income Opportunities Fund’s investment performance reflects voluntary fee waivers in effect. Absent these waivers, total return and yield would be lower. The Adviser intends to continue these arrangements at least through January 31, 2017, but there can be no assurance that City National Rochdale, LLC will continue to waive fees. 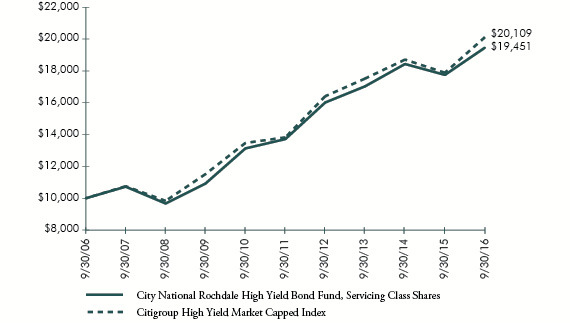 Effective January 31, 2016, City National Rochdale, LLC discontinued the voluntary fee waivers for the Municipal High Income Fund and High Yield Bond Fund. Mutual fund investing involves risk, including loss of principal. Bonds and bond funds are subject to interest rate risk and will decline in value as interest rates rise. The securities of mid-cap companies may have greater price volatility and less liquidity than the securities of larger capitalized companies. Emerging markets involve heightened risk related to the same factors as well as increased volatility and lower trading volume. The California Tax Exempt Bond Fund invests primarily in California securities and may be more volatile and susceptible to a single adverse economic or regulatory occurrence affecting those obligations than a fund investing in obligations of a number of states. The credit quality breakdown depicts the credit quality ratings of the Fund’s portfolio securities that are rated by one or both of two major nationally recognized statistical rating organizations (“NRSROs”). The two NRSROs currently utilized for this purpose are Standard & Poor’s (S&P) and Moody’s. When a bond is rated by S&P that rating is utilized. If it is not rated by S&P, the Moody’s rating is utilized. When a security is rated by neither, it is classified as “Not Rated”. For bonds, these credit quality ratings are shown without regard to gradations within a given rating category. For example, securities rated “AA-” or “AA+” have been included in the “AA” rated category. Long-term ratings are measured on a scale that generally ranges from AAA (highest) to D (lowest). The Fund seeks to provide current income by investing primarily in securities either issued or guaranteed by the U.S. Government or its agencies or instrumentalities. The performance in the above graph does not reflect the deduction of taxes the shareholder will pay on Fund distributions or the redemptions of Fund shares. Investment performance reflects fee waivers in effect. In the absence of such waivers, total return would be reduced. The Fund’s comparative benchmark does not include the annual operating expenses incurred by the Fund. Please note that one cannot invest directly in an unmanaged index. The graph is based on only Servicing Class Shares; performance for Institutional Class and Class N Shares would be different due to differences in fee structures. Commenced operations on February 1, 2012. The Fund’s Servicing Class Shares are available only to fiduciary, advisory, agency, custodial and other similar accounts maintained at City National Bank and certain retirement plan platforms. The Fund’s Institutional Class Shares are available only to fiduciary, advisory, agency, custodial and other similar accounts maintained at City National Bank which meet the Fund’s minimum initial investment requirement, and certain tax-deferred retirement plans (including 401(k) plans, employer-sponsored 403(b) plans, 457 plans, profit sharing and money purchase pension plans, defined benefit plans and non-qualified deferred compensation plans) held in plan level or omnibus accounts. Institutional Class Shares’ performance for the period of October 1, 2006, to February 1, 2012, is that of the Servicing Class Shares. The Fund seeks to provide current income by investing in a diversified portfolio of fixed income securities, primarily investment grade corporate bonds issued by domestic and international companies denominated in U.S. dollars. The graph is based on only Servicing Class Shares; performance for Class N Shares would be different due to differences in fee structures. Credit quality is based on ratings from Standard & Poor’s, a division of The McGraw-Hill Companies, Inc. (“S&P”). Where S&P ratings are not available, credit quality is based on ratings from Moody’s Investor Services, Inc. (“Moody’s”). S&P and Moody’s ratings have been selected for several reasons, including the access to information and materials provided by S&P and Moody’s, as well as the Fund’s consideration of industry practice. The Not Rated category, if applicable, consists of securities that have not been rated by S&P or Moody’s. The Fund seeks to provide current income exempt from federal and California state income tax by investing primarily in California municipal bonds and notes. 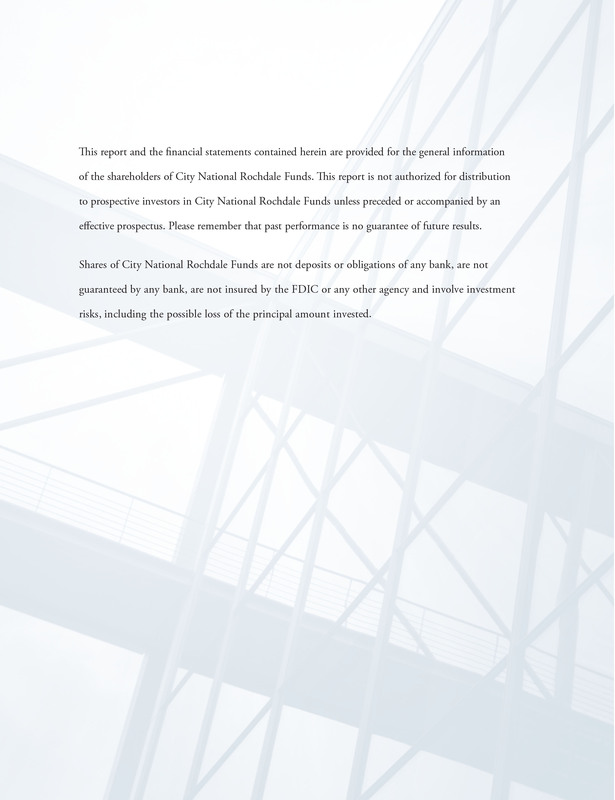 The Fund’s Servicing Class Shares are available only to fiduciary, advisory, agency, custodial and other similar accounts maintained at City National Bank. The Fund seeks to provide a high level of current income that is not subject to federal income tax. The performance in the above graph does not reflect the deduction of taxes the shareholder will pay on Fund distributions or the redemptions of Fund shares. Investment performance reflects fee waivers in effect. In the absence of such waivers, total return would be reduced. Effective January 31, 2016, the Adviser discontinued the voluntary fee waivers for the Fund. Commenced operations on December 30, 2013. The Fund seeks to maximize total return by investing primarily in fixed income securities rated below investment grade including corporate bonds and debentures, convertible and preferred securities, zero coupon obligations and debt securities that are issued by U.S. and foreign governments. The graph is based on only Servicing Class Shares; performance for Institutional and Class N Shares would be different due to differences in fee structures. Commenced operations on February 2, 2012. Institutional Class Shares’ performance for the period from October 1, 2006, to February 2, 2012, is that of the Servicing Class Shares. The Fund seeks current income and, to the extent consistent with this goal, capital appreciation, by investing primarily in fixed income securities. The graph is based on only Class N Shares; the performance for Institutional Class Shares would be different due to differences in fee structures. 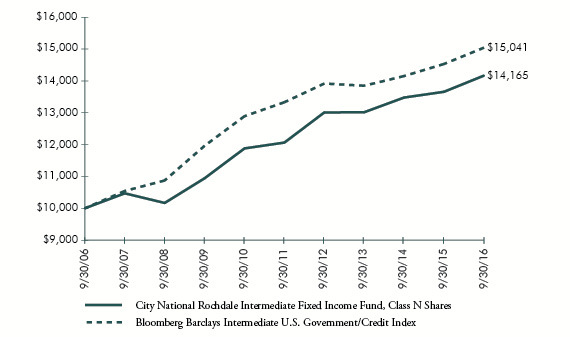 The predecessor to the City National Rochdale Intermediate Fixed Income Fund (the “Predecessor Fund”) commenced operations on December 31, 1999. On March 29, 2013, the Predecessor Fund was reorganized into the Fund. The performance results for the Class N Shares of the Fund for the period October 1, 2006, to March 29, 2013, reflect the performance of the Predecessor Fund’s Shares. Commenced operations on December 20, 2013. 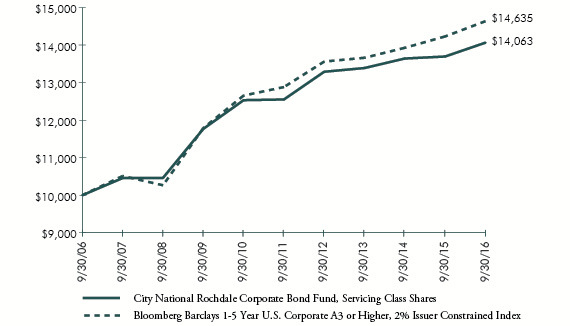 The performance results for Institutional Class Shares of the Fund for the period of October 1, 2006, to March 28, 2013, reflect the performance of the Predecessor Fund’s shares. The performance results for the Institutional Class Shares of the Fund for the period March 29, 2013, to December 19, 2013, reflect the performance of the Class N Shares. The Fund’s Institutional Class shares are available only to fiduciary, advisory, agency, custodial and other similar accounts maintained at City National Bank which meet the minimum initial investment requirement of $1,000,000 and certain tax deferred retirement plans (including 401(k) plans, employer sponsored 403(b) plans, 457 plans, profit sharing and money purchase pension plans, defined benefit plans and non-qualified deferred compensation plans) held in plan level or omnibus accounts. The Fund seeks a high level of current income by investing primarily in fixed income securities. 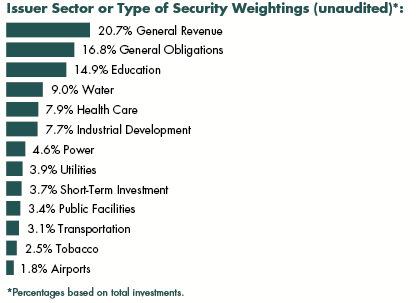 The Fund’s comparative benchmarks do not include the annual operating expenses incurred by the Fund. Please note that one cannot invest directly in an unmanaged index. 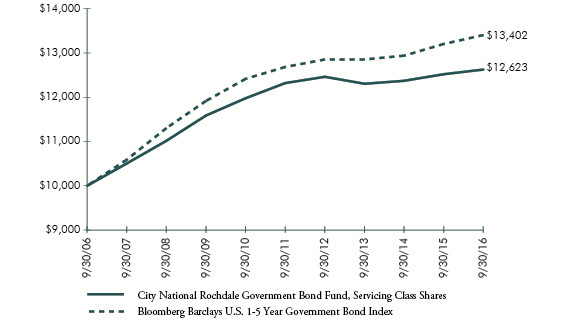 The predecessor to the City National Rochdale Fixed Income Opportunities Fund (the “Predecessor Fund”) commenced operations on July 1, 2009. On March 29, 2013, the Predecessor Fund was reorganized into the Fund. 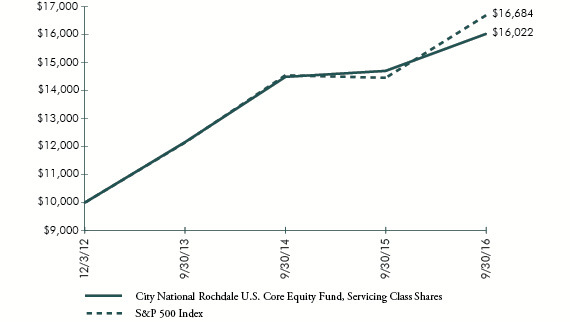 The performance results for the Class N Shares of the Fund for the period July 1, 2009, to March 29, 2013, reflect the performance of the Predecessor Fund’s Shares. The Fund posted a return of -2.11% for Q3, underperforming the blended benchmark’s (Dow Jones U.S. Selected Dividend Index: 60%; BofA ML Core Fixed Rate Preferred Securities Index: 25%; MSCI U.S. REIT Index: 15%) return of 0.74%. Calendar year to date, as of September 30, 2016, the Fund delivered a return of 13.07%, lagging the blended benchmark’s 13.59% return. For the fiscal year ended September 30, 2016, the Class N Shares of the Fund generated a 19.50% return, outperforming the benchmark’s return of 19.00%. The Fund declined -35 basis points in September, essentially in-line with its benchmark, during a month in which defensive and income stocks turned in a mixed performance against a flat broader market. MLPs and Utilities were up +185 basis points and +54 basis points, respectively, while REITs and Staples were down -183 basis points and -154 basis points, respectively. At the same time, underweight preferreds were down -1.0%. Stock reactions to portfolio events, including a number of capital raisings, a buy-side acquisition, and earnings, were modestly negative during the month. The Institutional Class Shares of the Fund posted a return of 4.37% for Q3, outpacing the S&P 500 Index’s return of 3.85% by 52 basis points. Calendar year to date, as of September 30, 2016, the Fund delivered a return of 4.18%, 366 basis points under the S&P 500 Index’s return of 7.84%. For the fiscal year ended September 30, 2016, the Institutional Class Shares of the Fund returned 9.25%, versus 15.43% for the S&P 500 Index. 3. underperformance of high quality, growth stocks, especially in the Industrials and Technology sectors, as the market has preferred stocks with higher dividend yield or a value orientation. We are maintaining our focus on high quality, visible earnings and growth companies in our “Choppy Seas” investment thesis, in which we seek to address bouts of market volatility. The Fund posted returns of 6.71% for Q3, underperforming the MSCI Emerging Markets Index and the MSCI Emerging Markets Asia Index returns of 9.03% and 10.51%, respectively. Calendar year to date, as of September 30, 2016, the Fund returned 8.97%, compared with 16.02% and 12.99% for the MSCI Emerging Markets Index and the MSCI Emerging Markets Asia Index, respectively. For the fiscal year ended September 30, 2016, Class N Shares of the Fund outperformed its benchmarks, with a total return of 17.81%, compared to a 16.78% return for the MSCI Emerging Markets Index (net) and 16.90% for the MSCI Emerging Markets Asia Index (net). and exposure in Indian Information Technology services. The Fund’s Consumer Discretionary portfolio also hurt the Fund during the month. 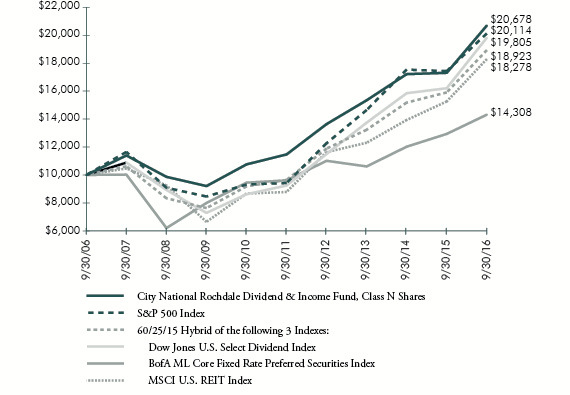 The Dividend & Income Fund’s, U.S. Core Equity Fund’s and Emerging Markets Fund’s investment performance reflects voluntary fee waivers in effect. Absent these waivers, total return and yield would be lower. The Adviser intends to continue these arrangements at least through January 31, 2017 but there can be no assurance that City National Rochdale, LLC will continue to waive fees. Effective January 31, 2016, City National Rochdale, LLC discontinued the voluntary fee waivers for the Dividend & Income Fund, U.S. Core Equity Fund and Emerging Markets Fund. Mutual fund investing involves risk including lose of principal. Bonds and bond funds are subject to interest rate risk and will decline in value as interest rates rise. The securities of mid-cap companies may have greater price volatility and less liquidity than the securities of larger capitalized companies. Emerging markets involve heightened risk related to the same factors as well as increased volatility and lower trading volume. The Fund seeks to provide significant income and, as a secondary focus, long-term capital appreciation, by investing primarily in income-generating securities, principally comprised of dividend-paying equity securities. The predecessor to the City National Rochdale Dividend & Income Fund (the “Predecessor Fund”) commenced operations on June 1, 1999. On March 29, 2013, the Predecessor Fund was reorganized into the Fund. The performance results for the Class N Shares of the Fund for the period October 1, 2006, to March 29, 2013, reflect the performance of the Predecessor Fund’s Shares. The Fund seeks to provide long-term capital appreciation by investing primarily in common stock of large and middle capitalization corporations domiciled in the United States. Commenced operations on December 3, 2012. The Fund’s Institutional Class shares are available only to fiduciary, advisory, agency, custodial and other similar accounts maintained at City National Bank which meet the minimum initial investment requirements, and certain tax-deferred retirement plans (including 401(k) plans, employer-sponsored 403(b) plans, 457 plans, profit sharing and money purchase pension plans, defined benefit plans and non-qualified deferred compensation plans) held in plan level or omnibus accounts. The Fund seeks to provide long-term capital appreciation by investing primarily in the equity securities of companies that are operating principally in emerging market countries. The graph is based on only Class N Shares; performance for Class Y Shares would be different due to differences in fee structures. 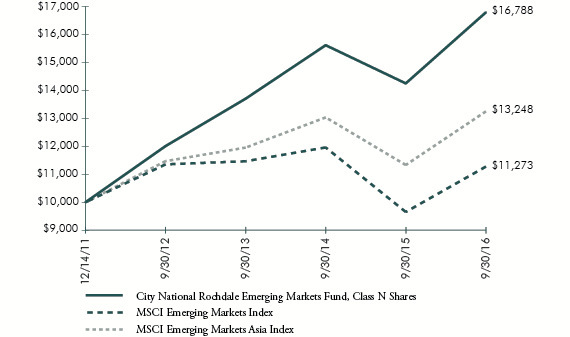 Shares of the predecessor to the City National Rochdale Emerging Markets Fund (the “Predecessor Fund”) commenced operations on December 14, 2011. On March 29, 2013, the Predecessor Fund was reorganized into the Fund. The performance results for the Class N Shares of the Fund for the period December 14, 2011, to March 29, 2013, reflect the performance of the Predecessor Fund’s Shares. Commenced operations on June 1, 2016. Class Y Shares’ performance for the period from December 14, 2011 to June 1, 2016 is that of the Class N Shares. Percentages are based on Net Assets of $5,735,678 (000). The rate reported is the 7-day effective yield as of September 30, 2016. Zero coupon security. The rate reported is the effective yield at time of purchase. Floating Rate Security — The rate reported is the rate in effect on September 30, 2016. Put and Demand Feature — The date reported is the next reset or put date. Securities are held in conjunction with a letter of credit from a major bank or financial institution. For the year ended September 30, 2016, there have been no transfers between any of the fair value hierarchy levels. Transfers between Levels are recognized at period end. Amounts designated as “—” are either $0 or have been rounded to $0. For more information on valuation inputs, see Note 2 — Significant Accounting Policies in the Notes to Financial Statements. Percentages are based on Net Assets of $150,658 (000). STRIPS — Separate Trading of Registered Interest and Principal of Securities. Percentages are based on Net Assets of $128,500 (000). Security exempt from registration under Rule 144A of the Securities Act of 1933. These securities may be resold in transactions exempt from registration normally to qualified institutions. On September 30, 2016, the value of these securities amounted to $22,710 (000), representing 17.7% of the net assets of the Fund. 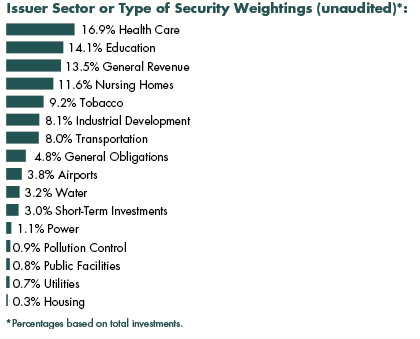 Security is considered illiquid. The total market value of the securities as of September 30, 2016 was $3,409 (000) and represented 2.6% of net assets of the Fund. Percentages are based on Net Assets of $98,138 (000). Pre-Refunded Security — The maturity date shown is the pre-refunded date. Represents an investment in a tender option bond residual interest certificate purchased in a secondary market transaction. The interest rate shown bears an inverse relationship to the interest rate on a tender option bond floating rate certificate. The interest rate disclosed reflects the rate in effect on September 30, 2016. Security exempt from registration under Rule 144A of the Securities Act of 1933. These securities may be resold in transactions exempt from registration normally to qualified institutions. On September 30, 2016, the value of these securities amounted to $1,000 (000), representing 1.0% of the net assets of the Fund.